Although most children take to water naturally, parents will still undoubtedly worry about their child’s safety when they first learn to swim. Our Two Bare Feet Child Swim Float Vest will dispel some of that natural worry by giving your child a little extra support when they’re first getting to grips with the water. Suitable for children aged 1 – 7 years, our float vests will comfortably guide your child through all stages of learning to swim, from their very first time in the water right up to independent swimming, be it in a pool or the sea. Our supportive swim aid features a front zipper, accompanied by a Velcro tab for extra security, meaning the vest can be put on quickly and easily, without claiming too much valuable swimming time. Choose from our two types of child float vest, one of which has removeable floats inside making it perfect for guiding your child through swimming levels. Alternatively opt for our float jacket, which features non-removeable internal floats, ideal for the very first ventures into the water. The beauty of our swim vests is their mobility: your child doesn’t need to be encumbered by restrictive arm bands whilst learning to swim. Instead, our float vests leave the arms free, allowing your little ones to get to grips with the water naturally and efficiently, with the same amount of support as if they were wearing inflatable bands. As with our whole baby range, the child float vest is made with flatlock seam construction. With comfort being paramount, this ensures there are no irritating ridged seams to detract from the enjoyment of swimming. Made with 2mm thick neoprene, our jackets are wearable, comfortable and offer UV protection on covered areas. 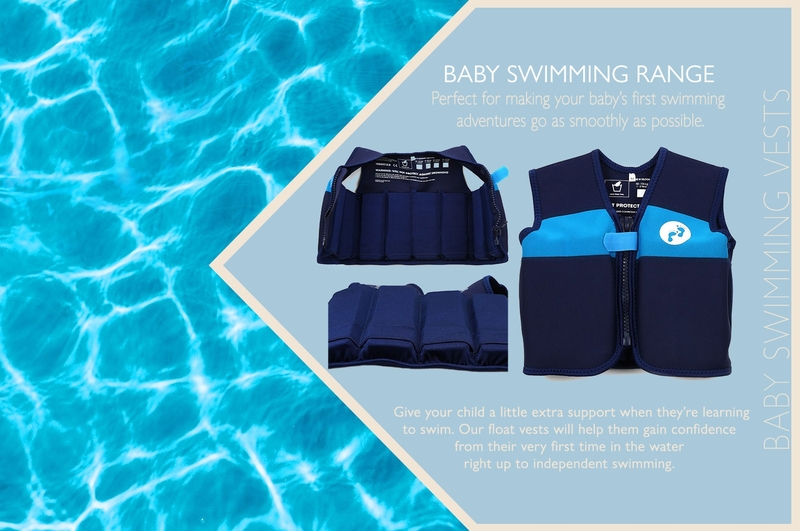 When you’re preparing your child for their first swimming experience, make sure you purchase a swim float vest as part of one of our swim kits. With a huge variety to choose from, each kit will help ensure your child has the best swimming experience possible, as well as keep them safe. Please remember that whilst our swim float vest are excellent swimming training aids, they are not life jackets and should not be treated as such.